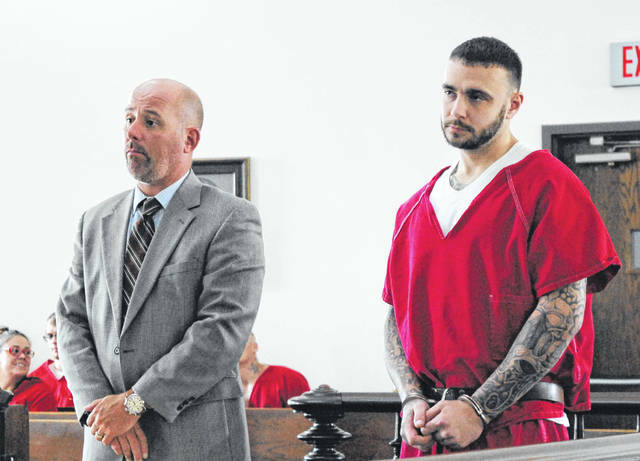 Timothy Seitz, right, stands in Highland County Common Pleas Court on Wednesday with attorney J.D. Wagoner. A Greenfield man was ordered to serve four years in prison on Wednesday after he pled guilty to burglary and receiving stolen property — crimes committed in connection with a string of break-ins in the Greenfield area over the summer, according to court documents. Timothy Seitz, 28, was sentenced to three years for burglary, a second-degree felony, and one year for receiving stolen property, a fourth-degree felony, for a total of four years in prison. As previously reported, court documents say Seitz allegedly robbed a home and stole a GMC truck with Jacob McGraw, 18, Bainbridge. McGraw has a laundry list of charges filed against him in common pleas court for allegedly breaking into multiple homes over the summer and stealing six guns, two cars, cash and other items, and leading authorities on a pursuit through the streets of Greenfield. His case is still pending. A Highland County Grand Jury indicted Seitz and McGraw in August, charging Seitz with one count of burglary, a second-degree felony; one count grand theft of a motor vehicle, a fourth-degree felony; one count of grand theft of firearms, a third-degree felony; one count of theft from a person in a protected class, a fourth-degree felony; and one count of receiving stolen property, a fourth-degree felony. All the charges except those to which Seitz pled guilty were dropped as part of a plea agreement, as well as a separate case filed this month charging him with aggravated possession of methamphetamine, a fifth-degree felony. McGraw was indicted on three counts of burglary, a second-degree felony; two counts of grand theft of a motor vehicle, a fourth-degree felony; three counts of grand theft of firearms, a third-degree felony; one count of theft from a person in a protected class, a fourth-degree felony; two counts of theft, one classified as a fifth-degree felony, one classified as a first-degree misdemeanor; one count of failure to comply with the order or signal of a police officer, a third-degree felony; and one count of possessing criminal tools, a fifth-degree felony. The indictment includes a forfeiture specification, a component of a criminal indictment which lists property subject to forfeiture due to its involvement in a crime. According to McGraw’s six-page indictment, the 18-year-old allegedly broke into three homes in May and June, and stole guns from all three, including shotguns, long rifles and handguns, along with cash, gold coins, jewelry, nursing equipment, a PlayStation game, a laptop, a Nikon camera and a camcorder. McGraw also stole a 2017 GMC truck and a 2012 Chevy Malibu on separate occasions, according to the indictment. According to a law enforcement affidavit, McGraw also fled from Greenfield police in June when they tried to arrest him on an active warrant. McGraw allegedly reached speeds of 50 and 60 mph in the village as he careened through the streets, going airborne after driving over a set of railroad tracks and nearly hitting a group of children. He later bailed out of the truck and ran from officers on foot, but was eventually apprehended, according to the affidavit. When authorities searched McGraw’s truck, they found a large pry bar, a long flat head screwdriver, latex gloves and a paintball mask, as well as a “leafy green substance,” the affidavit said.